THE ANNE OF GREEN GABLES [13 BOOK DELUXE COLLECTION] This collection includes thirteen books in total. Eleven of the books are written by Lucy Maud Montgomery. ALSO INCLUDED AS A BONUS ARE THE ENTIRE THIRTEEN AUDIOBOOKS. *** Featuring Dynamic Chapter Navigation Linking & Professional Formatting for a Premium Reading Experience. Anne of Green Gables (1908) is a bestselling novel by Canadian author Lucy Maud Montgomery. Written as fiction for readers of all ages, since the mid-twentieth century, the literary classic has been considered a children's novel. It recounts the adventures of Anne Shirley, a young orphan girl sent to a middle-aged brother and sister who have a farm on Prince Edward Island, and who had intended to adopt a boy to help them. The novel recounts how Anne makes her way with the Cuthberts, in school and the town. Since publication, Anne of Green Gables has sold more than 50 million copies, and has been translated into 20 languages. Numerous sequels were written by Montgomery, and since her death, another sequel has been published, as well as an authorized prequel. The original book is taught to students around the world. It has been adapted as films, made for television movies, and animated and live-action television series. Plays and musicals have also been created, with productions annually in Canada since 1964 of the first musical production, which has toured in Canada, the United States, Europe and Japan. Others have been produced in Canada and the United States. Lucy Maud Montgomery (November 30, 1874 – April 24, 1942), called "Maud" by family and friends and publicly known as L. M. Montgomery, was a Canadian author best known for a series of novels beginning with Anne of Green Gables, published in 1908. Anne of Green Gables was an immediate success. The central character, Anne, an orphaned girl, made Montgomery famous in her lifetime and gave her an international following. The first novel was followed by a series of sequels with Anne as the central character. Montgomery went on to publish 20 novels as well as 500 short stories and poems. Because many of the novels were set on Prince Edward Island, Canada and the Canadian province became literary landmarks. She was awarded Officer of the Order of the British Empire in 1935. 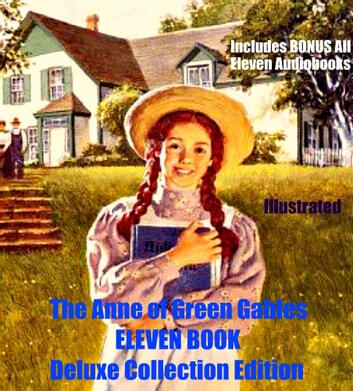 Books related to ANNE OF GREEN GABLES [13 BOOK DELUXE COLLECTION] Anne of Green Gables, Anne of Avonlea, Kilmeny of The Orchard, The Story Girl, Anne of the Island, Anne's House of Dreams, Rainbow Valley, Rilla of Ingleside, Chronicles of Avonlea PLUS 4 MORE! For as long as I can remember, Anne of Green Gables has been my all time FAVE.I just love ito very much. Anne of Green Gables is my new favourite book series. It is interesting, adventerous, and a perfect book for eveyone! Don't buy this "collection", whatever you do! You're paying $3 just for the contents page. It's only one page! shame whoever put this on Kobo!